These days mark the third-year anniversary of the mass poisoning by toxic emissions of the Berezovka children. For the past three years, children have continued to suffer from loss of consciousness, headaches, seizures, numbness of the extremities and other symptoms of a serious disease—toxic encephalopathy. That was a diagnosis received by three children in Moscow. That is why this year Crude Accountability and the Children or Oil Coalition launched a crowdfunding campaign to raise money in support of medical assistance to children from the village of Berezovka. We are currently collecting money for four girls, who are among the most adversely affected from the village and are at risk of becoming disabled without prompt examination and competent treatment from the effects of toxic poisoning. Kazakh authorities and KPO refuse to take responsibility for the tragedy. In 2016, the parents of the affected children, supported by environmentalists from around the world, sought help from the consortium members, the government of Kazakhstan, and the leaders of the participating countries of KPO., Unfortunately, they did not receive an adequate response. As a result, they are now asking for help from ordinary people. Anything helps! Please help us LIKE and SHARE the campaign via social media. “Our coalition will continue to seek help for the Berezovka children. We invite all who do not want more injured children to join us. 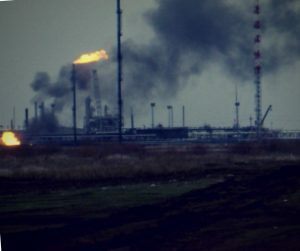 For us, these children are our children”, says Sergey Solyanik, consultant for Crude Accountability and co-coordinator of the “Children or Oil” coalition.